An innocent private hire driver was subjected to a vicious assault by 32-year-old Christopher Smethurst, who was heavily intoxicated with alcohol and drugs. Smethurst unleashed the attack on the cab driver after finding out that his girlfriend had slept with one of his neighbours. In a fenzied outburst, Smethurst repeatedly stabbed the cab driver with a 6-inch knife, leaving him with wounds in his head, back and hands. The 42-year-old victim, who was working for Street Cars in Moss Side, picked up Smethurst outside Chico’s takeaway and took him to an address in Ruskin Avenue. The two were said to be “chatty and friendly” the whole journey, but when they arrived at their destination, the private hire driver turned to the back seat to take payment and was lunged at by Smethurst who was holding a large knife. The court heard that Smethurst began to shout “die, die, die” as he stabbed his victim multiple times in the neck. Fighting for his life, the driver attempted to break free but was unable to after Smethurst used the seat beat to pin him back against his seat. Smethurst continued to stab his victim, this time in the face. The driver eventually broke free and managed to exit his vehicle, where Smethurst continued the sickening attack. During the attack, the driver lost both his shoes but still managed to run barefoot seeking help from local residents. One resident allowed him refuge in their home where they called the police. The victim was taken to hospital and was treated for ten serious stab wounds to his hands, arms, chest and head. He had to undergo plastic surgery to repair the stab wounds and damage to nerves and tendons. Smethurst was arrested ten days later in Crewe where was was planning to rob a shop with a toy gun he had sprayed black. His DNA, which was found in a bag which he had left at the takeaway on the night of the attack, along with CCTV footage and evidence from the driver, eventually linked Smethurst to to horrific assault. Judge John Potter said Smethurst was considered “so dangerous” that he would have to serve a minimum two-thirds of a 19 years and four months jail sentence. Smethurst pleaded guilty to wounding with intent to cause grievous bodily harm and possessing an imitation firearm. 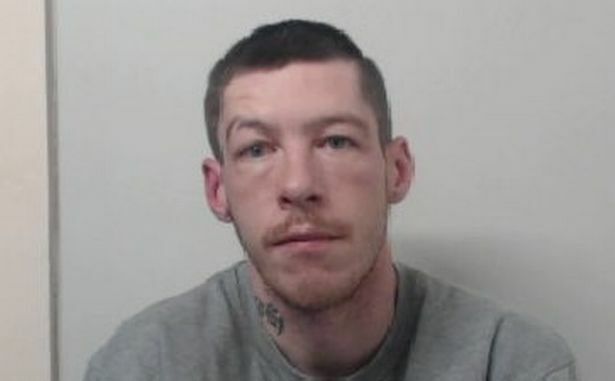 He was sentenced at Minshull Street Crown Court.